The mental health app marketplace is “very messy”. If you are looking for a quality mental health app that offers you effective and efficient methods and techniques that will help you to form healthier habits and learn how to relax and improve your way of life, choosing the right one can be quite hard. We decided to help you, we did our research and we found the right app that leads you to healthier habits, improving your quality of life in general. Let’s discuss it. Developed for IOS users, offered by Jennie Francis that helped hundreds of clients to make positive changes in their life, this health app is helping users to improve their quality of life and get rid of their bad habits, to enhance their mental well-being. 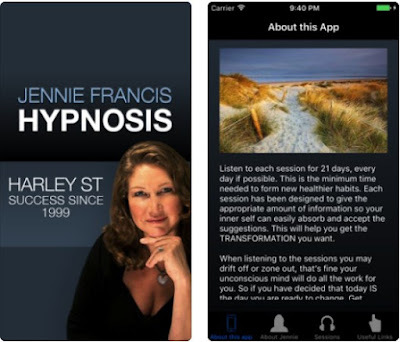 Users one the app just by listening to the audio sessions with highly effective methods and hypnosis techniques will be able to make their unconscious mind form healthier habits. Completely naturally and safely, users with the help of this app will improve their mental health and make positive lifestyle changes. The Jennie Francis Hypnosis has incredibly helpful and useful features for its users, helping them to enhance their well-being and regulates their equilibrium. With the app’s help, users will be able to get rid of bad habits, make positive changes and improve their health in general. By using this app, only by listening to the carefully designed audio sessions users will just need to let their unconscious mind absorb the appropriate amount of information and accept the suggestions offered. It’s the best for users to listen to one audio session a day, without interruptions, for 21 days. Each time the user is listening to an audio session he may zone out but that will positively affect his unconscious mind to form healthier habits. Users with the app will be able to stop smoking, lose weight, alleviate sleep deprivation and improve confidence issues. Also, by using the app users will learn how to relax their mind completely and learn how to stop stress and anxiety. Download the app for free now on App Store and take care of your mental health!